The clever title of this duo exhibition has a double meaning, Scenes by two artists, and scenes of similar places around the Scottish Islands as seen by Amy Marshall and Tracy Levine. That challenge to capture the world she sees is beautifully handled, often in soft, luminous pastel oils. 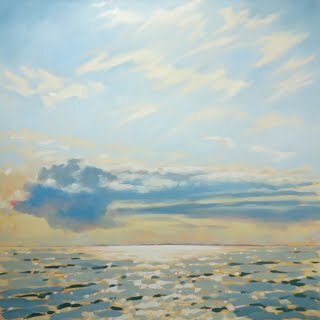 “Morning, East Coast” reflects the tranquillity of the scene, shards of an amber dawn through the clouds, a rippling sea turning on the tide across the wet sandy beach. Looking at the panoramic seascape, “White Sands of North Wick, Papa Westray”, you can almost sense the summer breeze in the air. Tracy Levine works from her studio in the South Lakes, Cumbria, but frequently visits the north west of Scotland and Outer Hebrides, inspired by the wild coastline, the ebb and flow of river and sea. 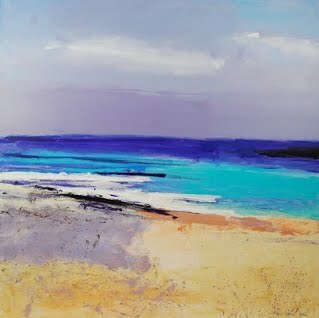 Levine works with acrylic and mixed media, featuring a rich array of colour to enhance the natural scenic view of sea, sky, heather and rock. 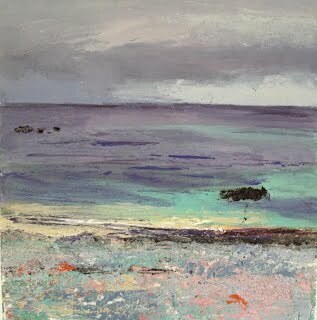 “A Day in Iona” is a stunning seascape, its rough sketchy outline, splattered with complex shades, contrasting bold purple and turquoise against the pale golden sand beneath the grey clouds. There’s more of an abstract quality to “Far Iona” as if sketched rapidly, to catch the immediacy of the moment, perhaps before a rain storm. It’s well constructed, the eye is both drawn to the distant horizon and also to white meadow flowers and pink poppies along the grassy shore. The magical atmosphere on Iona – a place of ancient spirituality – was of course, much beloved by the Scottish Colourists, Peploe and Cadell. And continues to entice contemporary artists back again and again. Amy and Tracy also show here a few of their colourful, sunny landscapes from travels in Languedoc, France, the Alps and Andes. 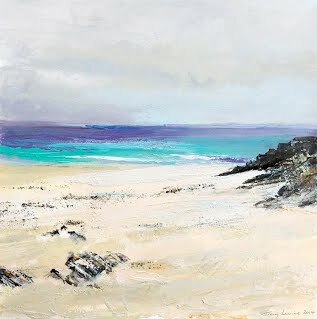 Walking around the exhibition, you are taken on a journey to these wild, romantic islands and distant shores from “Atlantic Coast” to “ Big Cloud over Coll and Tiree.” Such subtle shades and shadows between land, ocean and sky, flickering shafts of sunlight, and darkening clouds over shimmering waves of water. The light-filled Flaubert Gallery shows off this selection of contrasting, yet complementary, Scottish seascapes well, with the space to stand back and observe the full perspective of each spectacular, scenic view. Scene by Two: 29 August – 23 September, 2014.